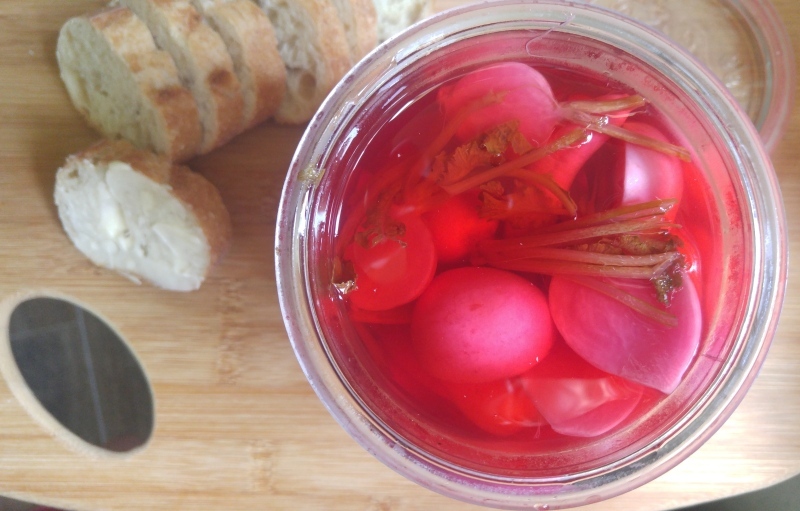 A beautiful and simple jar of pickled radishes graced every table at our Farm Dinner this past weekend. If you missed out on this great dinner, it was loads of fun. Make sure you hit the next one! Pickling is an easy way to use up all kinds of sturdy vegetables. We’ve pickled carrots, garlic, pearl onions, chard stems, all sorts of things can be preserved and made even more delicious and flavorful. The process I use is fast and easy, but doesn’t produce a long-time storing end product. These pickles should be stored in the fridge for not more than 2-3 weeks, but you’ll eat them so fast they won’t last that long. Scrub the radishes and trim off the tops about an inch above the radish. Slice radish in half, keeping the one-inch tops intact. Place into a clean canning jar with fresh lid or cleaned gasket (if using weck jars). While trimming the radishes, bring your brine to a boil in a medium sauce pan by combining water, vinegars, salt, and sugar and bringing to a boil. 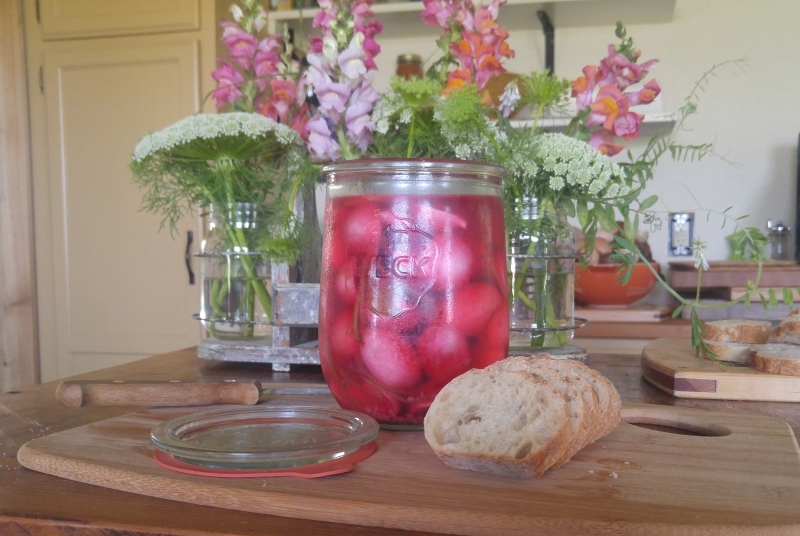 Pour hot brine over radishes in the jar, filling to 1/2 inch below brim. Secure lid. Allow jar to cool to room temperature before placing in the fridge. In a day or two, the radishes will be pickled, though still crisp. You can slice the radishes quite thin, though you will not have quite as crisp an end result. MAKE ME SOME PICKELD RADISHES! !